Our scope of work typically includes the erection and installation of our fabricated components. We accomplish this part of our service by utilizing either our own erection crews or one of our qualified subcontract erectors. 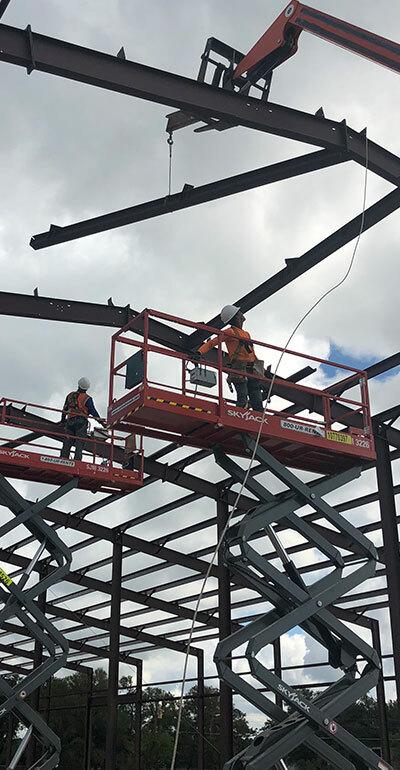 With either option, safety on the jobsite is top priority and our erector’s safety record is an important consideration during our evaluation and selection process. Our erectors must also have the same commitment to professionalism and customer service that we possess, simply because these fundamental elements make us who we are, and we won’t conduct our business any other way. Speedway Erector is highly experienced with Tilt Wall Erection. Tilt Wall Erection is a cost-effective, highly specialized technique for building that involves erecting concrete slabs for a building’s framework. Concrete is poured into customized frames and once the concrete has cured, the slabs are tilted from horizontal to vertical with cranes and braced into position. Tilt Wall Erection contrasts from prefabrication as moulds are formed specific for each building and are not reused like moulds through the prefabrication process. At Speedway Erection we welcome the opportunity to work from initial concept through completion – thereby re-integrating the roles of designer and constructor. Design-build is an alternative to the traditional design-bid-build project delivery method. Under the latter approach, design and construction services are split into separate entities, separate contracts, separate work. Speedway Erection has delivered design-build project across Texas, successfully with superior results – no matter what the project type. Speedway Erection utilizes open web truss secondary-framing, delivering roof support and shortening the installation of mechanical and electrical systems. Our compatibility with multiple wall and roofing systems provides you with amplified flexibility in construction design. The Long Bay is the perfect solution for manufacturing, warehouse, distribution and large retail applications. 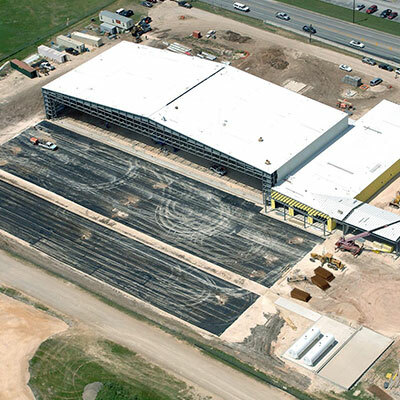 The single-source design, fabrication and schedule control eliminates inconsistencies and interruptions during the entire building design and erection process. LBS requires less bridging – no welding or inspections, reduced footings and a fewer number of interior columns. The result is a substantial overall cost savings and an opportunity of speed to market, typically by two to four weeks. 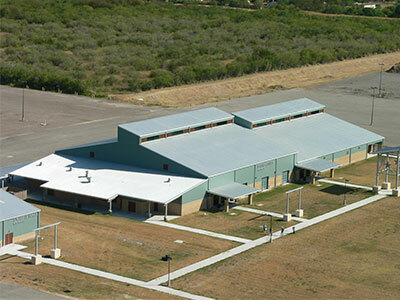 Long Bays is offered in bays from 40′ up to 70 feet. A Long Bay build is flexible in the design with less bridging that is attached with self-drilling screws, the ability to bolt to the main frame, and is stiffer and lighter than the bar joist. This open web purlin is fabricated of light-gauge cold-rolled steel with a 4″ chord width and 5″ seat depth. This approach can interface with load-bearing masonry or tilt-wall construction and offers a faster, more precise installation.